I really like the look of unfinished lines and strokes. I'm not sure if that just means I am lazy, or whether there's a part of me that just resonates with the reality of imperfection. I recently came across this old illustration, which was made during my year in India. 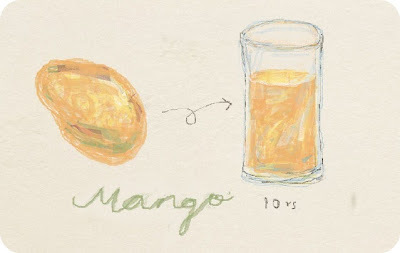 It was an ode to mango juice, the delicious elixir that appeared at all the juice-wala stands in April. Nothing beats a fresh mango juice on a dusty, hot day... except maybe mango lassi in a chilled glass bottle! And for only 10 rupees (17 US cents) might I add. If you go on to create anything, be sure to post a comment & share your fantastic handiwork! I've used odosketch but I can't get over the feeling of betraying my photoshop. I guess I'm a creature of habits. You have such a nice blog going on here. I look forward to seeing where it takes you! thanks for visiting, maria! the two programs are just so different -- i like the pastel crayon textures & minimalist interface that you get with odosketch, but photoshop is so much more versatile/powerful. i guess it depends what you want to do that day! ooh this odosketch thing looks really awesome!